Offering the chemist both ease of use and the potential to separate complex sample matrices, it’s easy to see why thin layer chromatography is such a popular separation technique. Thin layer chromatography (TLC) is a chromatographic method where the analytes are separated on a solid stationary phase plate, comprising of an adsorbent material coating on top of a sheet of aluminium or plastic. Sample spots (which can be quickly prepared from complex matrices) are applied to a stationary phase. As analytes elute selectively through the stationary phase, separation is therefore achieved. Compounds are identified by their degree of retention on the stationary phase, and compared with a reference-standard spot. Typically, a challenge for TLC separation is analyte co-elution (analytes not achieving adequate separation due to having similar retention times on the stationary phase). Typically, co-elution cannot be adequately resolve via optically determination. In recent years, ultraviolet (UV) detection has allowed for greater resolving fidelity. However, Mass Spectroscopy (MS) allows for even better specificity. 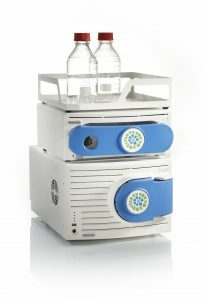 Using an interface device, such as the CAMAG TLC-MS 2 it is possible to connect the developed plate to a mass spectrometer for powerful real-time analysis, as the analytes elute (or co-elute!). To see examples of how the MiD and TLC-MS 2 can work together to give information rich data from complex sample media please refer to our Application Notes section.